In a previous post we learned how to include parts of a document in the generated output. The included parts are defined using tags. 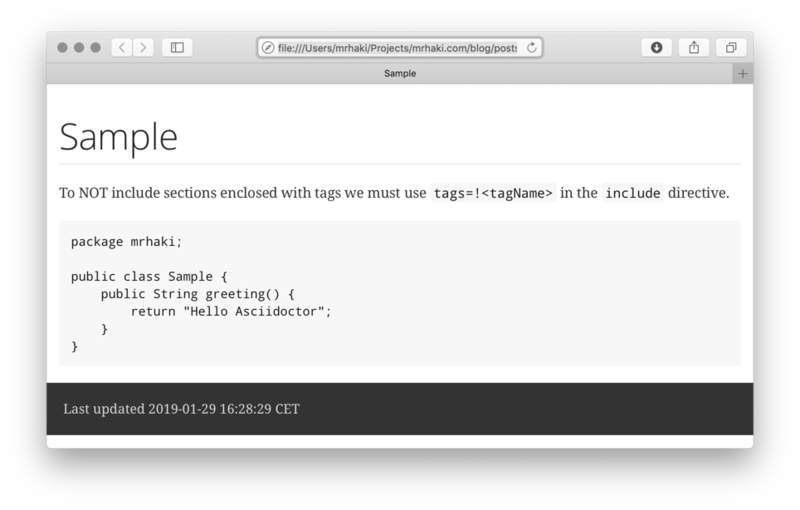 The start of a tag is defined in a comment with the format tag::tagName and the end has the format end::tagName. Next we must use the tags attribute for the include macro followed by the tagName. If we don't want to include a tag we must prefix it with an exclamation mark (!). Suppose we have an external Java source we want to include in our Asciidoctor document. To NOT include sections enclosed with tags we must use `tags=!<tagName>` in the `include` directive.